Askamore, the big moor or marsh, and its companion Askabeg, the little moor or marsh, lie under the western slopes of Sliabh Bhuí, a peak of some 420m (1369 ft) in the central area of north Wexford. 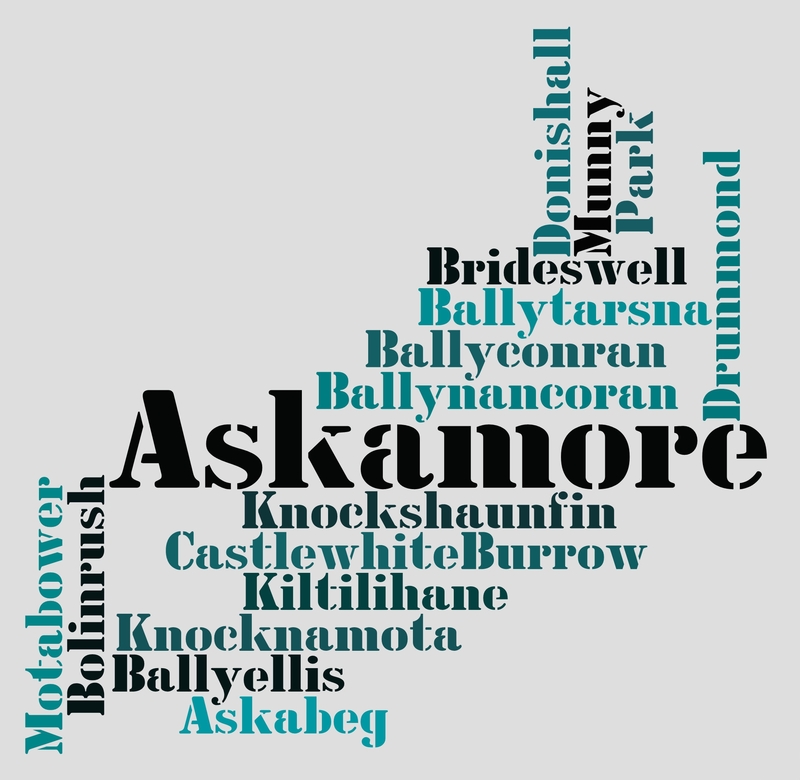 Askamore gives its name to an area of seventeen townlands which make up the Roman Catholic curacy in the parish of Kilrush. There are now approx 270 inhabited dwelling in this area of fertile rolling land, traditionally devoted to a mixture of tillage crops and grass lands. The area is served by a network of small roads intersecting the area between the main Carnew-Gorey road running west to east, and the Carnew-Ferns road running east-south-east under Sliabh Bhuí and Ballybeg. It was MacMurrough-Kavanagh country for many centuries until the clan was finally driven from their Borris Castle stronghold after the Cromwellian invasion of 1649-1650. In the Civil Survey taken soon after the Cromwellian conquest, the townlands of the area are mostly detailed under the Parish of Carnew, which was the civil administration of the time. Proprietors listed as of 1640 were Briene Kavanagh, Henry Kenny, Mr. Clebroke and Nicho Loftus. Questions about the Askamore Community Text Alert Scheme. My name is Senan Fox. My email address is ‘senanfox@yahoo.com’. I can also be found on Facebook. I live in the small village of Tarbert in North Kerry. I recently became interested in possibly setting up a community text alert scheme for my area in order to protect people and their property in this period of rising crime in rural areas. Following a Google search, I came across a story in the Irish Times of how your community set up a text alert scheme. When this in mind, I was wondering if you could tell me more about how your scheme works exactly and how you went about setting it up.There seems to be differing variations of the text alert scheme throughout the country (how it is financed and how it works) and I am eager to hear different ideas and proposals for the most cost-effective and straight-forward way to set one up. I would really appreciate any help or advice that you can provide. If you have any questions then please do not hesitate to contact me. Take care and best wishes for now, from Senan. Hi Senan,Thanks for contacting us. I’ll email you details of how we set up comm texting. hi i”ve recently found a link on bureau of military history for 1921 if you go on my facebook page dated today 15th of august you’ll access on it information of the askamore company of the north wexford division. enjoy, i did.